With feelings running high, it is scarcely surprising that some politicians, bankers, lobbyists, commentators, and members of the public have drawn hasty conclusions about Barclays and Libor interest-rate fixing. 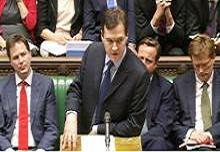 But George Osborne, the British Chancellor of the Exchequer, is in danger of breaching standards of statesmanship that many in the City of London, and elsewhere, might reasonably expect. Doubts hang over the approach of the UK’s government’s chief minister of finance on two specific points. The first in his attempts to divert blame onto his predecessors in government. It is true that Labour politicians including Gordon Brown, the former prime minister and chancellor, and Ed Balls, the current chief opposition spokesman on finance, have questions to answer about the regulatory regime over which they presided. It is also true that comments ascribed to Osborne in the Spectator magazine are open to interpretation, and may have been over-interpreted. But it is surely wrong for someone in Osborne’s position to give the impression that certain individuals are implicated, in a direct sense, in wrongdoing. Unsubstantiated, it is at least unbecoming for a Chancellor of the Exchequer to be associated with such accusations. Secondly, and perhaps more seriously, Osborne has allowed himself to implicate several other banks – including HSBC, RBS, UBS and Citigroup. These banks, he said while in the privileged surroundings of the House of Commons, “are under investigation”. It is apparent that official enquiries into Libor fixing may well engulf banks other than Barclays. But it is unclear, at present, how far the net will be cast and which institutions will be caught. HSBC, for one, has grounds to gripe about the way Osborne phrased his parliamentary answer on June 28. In its 2011 annual report HSBC has declared it “or its subsidiaries have been the subject of regulatory demands for information and are cooperating with their investigations.” Is that tantamount to being “under investigation”? Probably not. George Osborne is right to adopt a robust approach to the deficiencies in banking that are becoming ever more obvious. But he must also understand the importance of preserving, if not enhancing, the credibility of his office. His approach could do with a reboot. George Osborne, the UK Chancellor of the Exchequer, responding to the fining of Barclays bank for its part in the Libor rate-fixing affair, told the House of Commons on 28 June that: “HSBC and RBS are two of the banks under investigation, but international banks such as UBS and Citigroup are under investigation too, partly for activities conducted in this country”.